Scott Cormode is Hugh De Pree Professor of Leadership Development at Fuller, and previously also served as academic dean and as director of innovation. He founded the Academy of Religious Leadership, an organization for professors who teach leadership in seminaries, and its Journal of Religious Leadership. Author of the book Making Spiritual Sense: Theological Interpretation as Christian Leadership, Cormode has also published numerous articles on leadership, organization, and technology. He maintains case studies and other resources on leadership.fuller.edu, a website for developing Christian leaders. This faculty chair was established by the family of the late Hugh De Pree, an accomplished leader and brother of longtime Fuller board member Max De Pree, in order to further develop leadership training programs within the School of Theology and the De Pree Leadership Center. 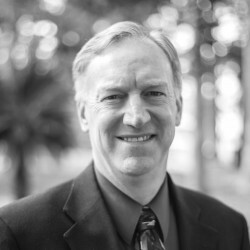 Cormode brought significant leadership and teaching experience to this position, as an ordained minister in the Presbyterian Church (USA) who served for the previous decade as George Butler Associate Professor of Church Administration and Finance at Claremont School of Theology. Cormode also served at Claremont as associate dean for institutional research, chair of the Curriculum Committee, chair of the Accreditation Team, and principal writer of the Long Range Planning Committee. Learn more about Dr. Cormode on his faculty profile.